Kirthi Jayakumar is a lawyer, researcher, journalist, human rights activist, UN volunteer, and a writer. The short stories are beautifully written and vary in terms of the characters, the setting, the backdrop, and the existence or absence of hope. 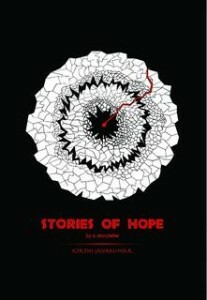 The book tells us the story of young girls – a girl who loses her family in a terror attack, a girl who is married off to an old man at the age of thirteen, a girl living in abject poverty, an orphan girl dreaming of becoming a singer; stories of young boys – the hungry boy in Ghana who walks hundreds of miles in search of food, the arrogant French boy who becomes friends with an old watch-maker, the boy forced to become a Fedayeen, the young Kashmiri boy held captive by terrorists; stories of mothers – the mother who loses her just born, the mother who is turned out by her grown-up son and now living in an old age home. All the stories are heart touching and deeply emotional. Do not be surprised if you shed a tear or two for the characters in the book. Each of them is troubled by a different burden, but what they all have in common is hope; the Arab refugee lives in hope of coming back to his motherland, the people of Egypt live with the hope of democracy, the lonely old woman lives with the hope that her son will return safely from the war. The narration style is steady and similar across all the stories – a bit confusing initially, a tormented character living with hope, and a great, unsuspecting climax. The language, though simple overall, has complex vocabulary sprinkled in, which I think is better avoided. Statements like “The canzones of her solipsistic musical skills had a life of their own, as they meandered along with her through her daily chores”, and “Her steps fringed the music with magic, as it swung upwards, meandering into a bubbling soliloquy, building up to a crescendo”, do more to confuse and frighten a reader, than enhance his interest in the story. BookGeeks: We would love to know more about you than what is already mentioned in your website. Can you please tell us something? Kirthi: I guess I’d say I am a bit of a nomad: in my thinking and in my ways. I am rooted to my family and friends, but for the most part, I enjoy being able to do different things, go from one to the next and just wander about doing different things. I am talkative, I have an insane imagination, I am allergic to chocolates and someday I hope to build a house on the clouds. I’m serious. BookGeeks: You seem to juggle a lot of things together right from law to research to journalism to volunteering for the UN and now writing. How do you do all of this? Kirthi: The truth is, when you put it that way, it feels like I’m doing a lot of things and have no time. But when you get down to it, it’s all just about keeping my day filled with things to do! I’m not one to sit put in one stream and keep doing just one thing – I like variety and I like filling my day with many different things to do. Be that as it may, I reckon time management has been helpful – I like the idea of being the White Rabbit in Alice in Wonderland – always looking to go somewhere with a watch in tow, saying “Oh dear, Oh dear – I’m going to be late!” but with more of a purpose and a lot of fun rather than worry/tension, with something or the other driving me each time. BookGeeks: Most people write books based on their professions; IIM grads write college stories, lawyers write legal thrillers, Media guys write about the media world. Being a lawyer, did you ever feel the urge to write books with a legal background? Kirthi: Actually, nope! I must be coming across as a bit of a degenerate to those in the legal fraternity when I say this – but being a lawyer in the conventional sense is not something I identify with. I never took to law with the intention of practice, and all I enjoyed doing was humanitarian work with a hint of academics in international law and human rights. I’m doing just that right now, and most of my stories have come from that backdrop. I think writing fiction with a lot of heavy legal angles and backdrops would come more naturally to someone who lives the system every day. BookGeeks: ‘Stories of Hope’ is a great book. How did you come up it? Kirthi: Funny story, I didn’t! All I did was to keep writing out stories – on my phone, in notebooks, in spaces between newspaper articles, on tissues and even on tables (yes, I was a vandal, but now I’m clear!). A time came when I had enough of them, and my best friend thought they were worthy of publication – she compiled the whole lot and sent it out. 25 rejections later came my silver lining, and I was published! BookGeeks: All the stories in the book are deeply emotional and very heart touching, and such stories coming from such a young author seems truly unbelievable. Were there any personal reasons behind writing stories on human suffering? Kirthi: Completely. My biggest driving factor was to tell the world these stories. Not many people know that there are difficult realities. We live in a world where we are most often driven by our own selfish needs – which means all we ever consider is ourselves. Which I guess is not a bad thing because the world works like that. But when I encountered real stories through work, I realised that there are so many issues that we don’t even know about, and I wanted to bring them to life through my stories. BookGeeks: My personal favourite in the book is “When the Mustard Seeds grew silent”. Which story was closest to your heart and why? Kirthi: Thanks much for that! It means a lot to me that you liked it. I can’t really say one story is closest to my heart – because I wrote them out at different times. Be that as it may, I reckon the one story I am happiest about having written was Sacrifice. It speaks of a very real thing in all our lives: we forget the ones we love, and remain couched in self-consuming hatred until it’s too late. BookGeeks: Writing a book is one part but finding a publisher, and then promoting a book is a different game altogether. What is your impression of all of this and of the publishing world in general? Kirthi: I think the publishing world, quite like any other professional field, has its own ups and downs, and navigating through that comes with its own set of challenges and such else. I think it all comes down to self-belief: Do you have what it takes? Can you walk the extra mile? Can you make the effort to write your book, to talk about your book, to put it up for the world? Affirmative for all – then you’re set! BookGeeks: What would be the one mistake which any debut author must avoid? Kirthi: Self-doubt. It was a huge mistake on my part, myself, but now I realise I have a place under the sun. BookGeeks: Your message to our readers? Kirthi: Never, ever let the art of reading die! BookGeeks: Any testimonial for BookGeeks.in?